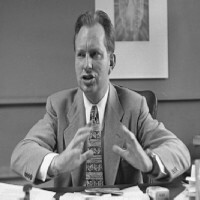 L Ron Hubbard claimed to have all sorts of knowledge, including the truth about flying saucers. It is belived that you can learn about them in Scientology. In a previous column I told of my experience with an evangelical church and how I failed to get saved. CJ Stone has a story about the 'healing' he received from followers of the Archangel Michael. Well, now I'm going to tell you all about an incident that happened to me when I was a member of the Scientology cult and close to learning the truth about UFOs. Guess what? I'm still looking for it! I was a little tired after my uphill trek from East Grinstead but felt my efforts were being rewarded, because there on the road outside the entrance of the stately home was a £10 note. Just what I needed! I picked it up gladly and even thought maybe Ron himself was helping to make life easier for me as reward for my inquisitive spirit. I decided I would spend it on a tape of of a lecture by the Scientology founder on the truth about flying saucers, as it was just the right amount I needed for this. Knowledge comes at a high price for followers of the cult, and I never had enough money for much of what was on offer so anything like this was much appreciated. It is a common practice in Scientology organisations for students to write up reports of any success they achieve and attribute to their studies, and also to announce it to their fellows. This serves as a morale booster and shows the benefits that can be there for the taking for anyone wise enough to follow this pathway. I lost no time in telling everyone in the Saint Hill course-room about my bit of luck and it was posted on the notice-board for all to read. Several students and staff members went to have a look to see if I'd missed any more stray paper money. I asked the supervisor if I could hear the lecture about the flying saucers. UFOs have been a particular interest of mine for a long time and extra-terrestrials and spacecraft play a large role in the beliefs of the Scientologists. I thought at last I might get some facts on the matter. Scientology is defined somewhere as "an aim at total knowledge," and the root of the word derives from the Latin verb scire: to know. It is presented as the the truth, just like so many other religions claim. Maybe it was true? And if it was, I wanted to know that truth. My payment was taken, and the supervisor went to get out the appropriate lecture on a reel of tape. I couldn't wait! At last I'd find out about these mysterious crafts. But it was not to be. Apparently this lecture wasn't in the library and the nearest copy was in America, which was a bit too far for me to go with the sort of money I had left! This seemed a mystery in itself, especially as Saint Hill prides itself on having all the L Ron Hubbard lectures and literature in its library. Maybe someone didn't want me to find out about the flying saucers after all? Maybe alien beings with advanced technology had been spying on me all along and had purposefully dematerialised that particular tape? I was so near and yet so far from the truth it seemed. The supervisor suggested that perhaps I would like to select an alternative reel to listen to from the very extensive range. Well, I was disappointed and feeling as if strange forces were at work here, but this was the very place to learn about such things. Strange forces get explained in the Scientology philosophy. I scanned through the long list and eventually settled for hearing the facts on the "between lives area." In other words, I was about to find out exactly where we go when we die. In Scientology life is believed to be immortal. Only bodies can die but the spirit, or "thetan," as it is called, lives on and can take a new body. Apparently we've all been doing this for 76 trillion years. I can't argue with that. I have enough difficulty remembering stuff from last year, or last week even! The supervisor got me the tape and set me up with a tape player and head-phones. I got to hear Ron himself telling me all about the stations on Mars and Venus where spirits of people who've recently died report in. He was actually there describing the scene. There are buildings like hospitals on the planet, and it is there that another bunch of thetans electronically implant a whole lifetime's worth of false images into the unlucky spirit who's just lost a body on Earth. This is what goes on before he or she is dumped back down here to pick up a new body at a maternity ward or elsewhere. This was the main gist of the lecture, so you know where not to go when your time arrives. Finally the tape ended. I'd been jotting down notes throughout and felt that all was not lost. I'd learned a lot that day. Maybe it's all true? Millions of people believe what Ron says including many top celebrities such as John Travolta and Kirstie Alley. Maybe it isn't? One things for certain though: I never did find out all about the flying saucers. I'm still searching. I feel a bit like Fox Mulder; I never got the whole truth but I know it's out there somewhere. And tenners at the wayside are a divine gift. Footnote: First published in Big Issue Cymru No. 130, December 1998. UFOs used to be more often known as Flying Saucers and there are countless theories and beliefs about them. Are they alien craft?